The first couple years of marriage aren't always easy. Add a new baby, maternity leave and a small income and things become strained. The first couple years of marriage aren't always easy. Add a new baby, maternity leave and a small income and things become strained. 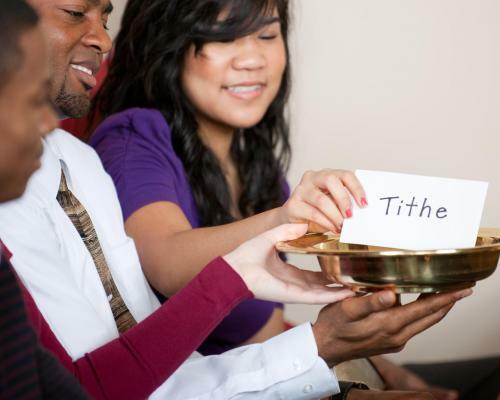 Regardless of our circumstances, tithe was something we always believed should be paid. God was embracing us with His love and providing for us every step of the way--how could we take anything from Him? Returning from my Friday grocery trip, my husband handed me an envelope. The bold type read "PayServe." I recognised the company--they had paid me when I was teaching. I began to wonder why they would communicate with me now. Quickly opening the letter, I read the first line, and began to cry, "We apologise for the inconvenience; however, we have overpaid you . . ."
The words blurred on the page as I called for my husband to come and read for himself. He too read the words and we looked at each other in disbelief. It was no small amount. The letter stated that we owed $940.58. We were devastated. How would we ever pay this back? I must admit anger was the first emotion I felt. "Why me?" I asked God. "Why right now?" Gently taking my hand, my ever-trusting husband began to pray, "Lord, you know this letter came at a bad time. We are stressed and overburdened. Please look after us. Amen." Over the weekend a heavy cloud followed me, continuously reminding me of our financial state. Before I slipped the small tithe envelope into the bag at church, my mind played tricks on me: "Julene, just keep your tithe this week. You need it, and God will understand." I ignored the thought and attempted to trust in God. and looking at the handwriting, I began to wonder. There was my name roughly written on the envelope. No return address, nothing. Opening the envelope quickly, something fell out--a cheque. Stunned, I looked for any identification on the envelope, cheque or contents. Nothing. I sat in awe on the edge of the bed while holding a bank cheque addressed to me and made out for $900. It was at that moment I realised what God had been teaching me all along: "I will never leave or forsake you." "Ask, and you shall be given." "Trust in Me and lean not on your own understanding." The texts came rushing to the surface along with a cascade of tears. I should have trusted God from the beginning and been grateful for all He had done and was doing in my life. Giving to God is a small part of what He requires of me--and I'm happy to give because I know my Lord is watching over me. Always be joyful. Keep on praying. No matter what happens, always be thankful, for this is God's will for you who belong to Christ Jesus. 1 Thessalonians 5:16-18. Julene Duerksen-Kapao is a high school teacher and mother, who lives in Longburn, New Zealand.